Panel Built, Inc. recently ran into an interesting and challenging task from a seafood company located in Seattle, Washington. 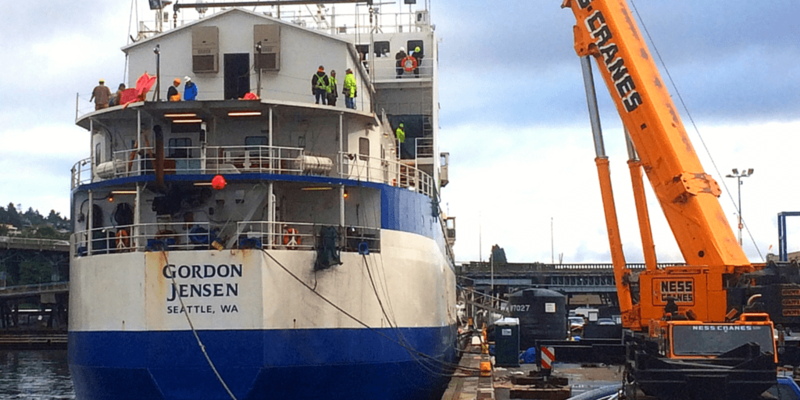 The company had a fishing route that regularly traveled from Seattle to Alaska, and they needed to provide their fishermen with a proper living and sleeping quarters on the ship. However, the structure needed to be constructed to withstand the high winds from the sea, harsh thunderstorms, and cold weather of the Alaskan climate. Panel Built, Inc. delivered to them a 28’ x 46’ prefabricated building with a steel exterior, gypsum interior, and polystyrene core to help battle the elements. The structure was manufactured in Georgia, put together in the Port of Seattle, and then installed on the top of the ship via a crane lift. The modular structure was secured to the steel deck of the ship and offered enough internal capacity to mount 2 level sleeping bunks for at least 30 people on the ship.